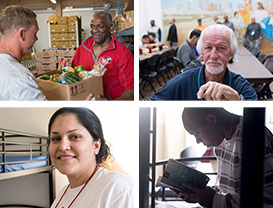 For people who care about the men, women, and children who are lost, hungry, and homeless in Maricopa County, Torchbearers lead the way by providing an affordable monthly gift each month that helps offer life-transforming solutions which save lives at Phoenix Rescue Mission. For most of her life, Noora never could have imagined the darkness and struggles she would one day face. Born in Finland, her family moved to Israel when she was still a small child. It's a time she recalls as enjoyable and normal—although she often found herself surrounded by a "culture of alcoholism," which left a lasting mark on her. Later, after marrying, she and her husband moved to Phoenix, far from her support system of family and friends. As her husband became increasingly abusive, Noora found herself isolated and didn't know where to turn. She turned more and more to alcohol to help her cope. When the abuse finally turned physical, Noora says, "I knew this was going nowhere good and was about to get worse." Desperate, the 27-year-old mother of three left her husband and began looking for a friend or a domestic abuse shelter who could take her young family in. After searching for several days, God led her to Phoenix Rescue Mission's Changing Lives Center, which quickly became a light for her in the darkness. Noora soon joined the Mission's Foundations program, an 8-plus week course that introduced her to recovery principles and gave her the basic skills necessary for a Christ-centered recovery. It was there she found God. “God somehow closed all the doors so I could come here, so that he could finally get a hold of me," Noora says. She has now moved through a number of the recovery programs available at the Changing Lives Center and is currently in the Servant Leadership program, which will give her the chance to invest her life in the Phoenix Rescue Mission. As a Monthly Torchbearer, you'll get an inside look at news from around the Mission and invitations to special events. Best of all, you’ll know that every month you’re providing a light of hope and life-changing care to people in need. Become a Monthly Torchbearer. Save lives every day. With an affordable gift each month, you are helping the Phoenix Rescue Mission focus more on saving lives.